Tomas Brandon is an electrical engineer by day, a pub musician some nights, and an officer in the Irish Army Defense Reserve some weekends and summer days. Ellen Porter is an American engineer on temporary assignment in Dublin. Come along to find out what happens when Ellen wanders into the pub where Tomas is playing one spring evening. If you like sweet romance, this Irish-American tale is for you. I’ve long had a soft spot in my heart for all things Irish. 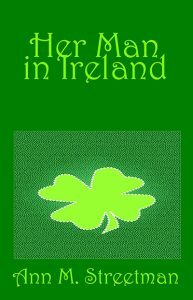 A few years ago I traveled in Ireland, and you’ll find some of my favorite Irish places in this book. Besides all that, how can a romance writer NOT write a book about an American woman falling in love with an Irish man who is an engineer by day, pub musician some nights, and a captain in the Irish Army Defense Reserve some weekends and summer days? I used the Myers-Briggs Type Indicator to inform my development of two very different characters the heroine Ellen and the hero Brandon. I have found these psychological classifications helpful in understanding relationships in my own life and in my writing. I wrote Ellen’s close relationship with her brother Jim as a celebration of two children who are dear to me. I am hoping these two children will remain as close as Ellen and Jim. On Friday evening when Ellen stepped out onto the street, she breathed in the spring air. It felt a lot like San Francisco. But that whole scene of her failed marriage was behind her. In her rear-view mirror. Not going to dwell on it. She was glad to be alone in control of her life in a fabulous city she had always wanted to visit. She felt almost happy as she peered into several pub windows and studied their menus posted outside. She paused at a pub that promised a live band at 7 o’clock. She checked her watch. It was 6:30. Why not. She followed him past a bar where mostly men perched on high stools. She noticed a man giving her an admiring glance as she passed. Good to know. She was divorced, not dead. She took her seat at the tiny table a few feet away from a stage that was no more than 6 inches higher than the floor. Four microphones, two speakers, and a chair were ready for the band. “How about a wheat beer?” He pointed at an item on the menu. In minutes he returned with her beer and Fish and Chips. She sipped her beer and ate her meal, occasionally looking around the crowded room. It was good to be in a happy noisy place. At 7 o’clock four men strolled past her table and stepped onto the stage. They began taking the instruments out of their cases and preparing to play. The only instrument Ellen recognized was a fiddle. One man started warming up on a round thing that appeared to be some sort of drum. Another man had a very short wind instrument and then there was the man who sat down in the chair and took several pieces out of the case, snapping things together. She watched as he strapped a bellows looking thing to his right elbow. He positioned a bag under his left arm. Then he lay three pipes across his lap and put another part of the instrument down on his right thigh. He looked over at the fiddle player and nodded. The musicians burst into action, filling the big room with a lilting Irish tune. Ellen was mesmerized by the musician in the chair as he thrust himself into the tune, his muscular body swaying and his fingers flying. He was amazing. As the tune ended, the audience applauded, stomped, and whistled. The man in the chair lifted his cap for a moment and looked straight at her. Ellen sucked in her breath. She couldn’t believe it. This musician was the auburn-haired man she saw in the cafeteria on her first day. Why hadn’t she recognized him immediately? The band continued the set as Ellen’s attention moved from one musician to another, always lingering on the auburn-haired man playing some kind of strange bagpipes. When the set ended, the crowd yelled for more. The auburn-haired man got up and whispered something into the fiddler’s ear. The fiddler nodded and passed the word to the other musicians and then said to the crowd, “All right then. We’ll play one last song in honor of an American lady visiting us tonight.” He pointed to Ellen. The audience started clapping and swaying to the tune, and Ellen joined in. After that, the musicians stood at the edge of the stage shaking hands and chatting with several people in the audience before they started packing away their instruments. She nodded yes and watched him taking apart his instrument and packing the pieces carefully into his case. He closed the case and set it down at the edge of the stage before stepping down to stand in front of her. Her hand still in his, she said, “Thank you, I’m glad to be here.” He held her hand a second longer. Ellen studied her companion’s profile. Up close, he was ruggedly handsome with a strong jaw and prominent nose. “Two wheat beers like the lady is drinking,” Tomas said. Tomas turned full face to smile at Ellen. His short auburn hair, wide face, and high cheekbones framed his deep-set golden hazel eyes. “About two months from now, but who is counting?” He laughed. “I’ll be going more for quality than quantity, I think.” He held her eyes for a moment. Benny returned with their beers. “My goodness. That was a long way to go to avoid an ex-girl friend,” Ellen said. The corners of his eyes crinkled as he smiled at her and took another sip of beer. They split the tab and left a tip. They stepped out into the night. “It’s a lot cooler now,” Ellen said, throwing her sweater around her shoulders. They stopped while he helped her into the sweater. He patted her shoulder. “There, that better,” he said. He took her hand and they strolled down the street. Ellen pointed to her suite hotel just ahead. He walked her up to the front entrance of the hotel. She pushed through the revolving door, and he turned to retrace his steps to the pub. Only one bartender remained as he walked back to the stage and picked up his pipes case. “Good night, Danny,” Tomas said, as he passed the bar again. “Good trad tonight,” the bartender said. Tomas walked out to the small parking area behind the building. He put the case into his Jeep and hopped in. Smiling, as he thought of how beautiful Ellen was, he pulled out into the deserted centre city street. He liked her long wispy dark hair and gray-green eyes. Almost as tall as he, she looked athletic with sturdy shapely legs, not skinny. He wouldn’t call her a babe, but she was plenty curvy. She would fill his arms with warmth and softness. Attractive and smart, the kind of woman he wanted to spend more time with. The kind of woman he was looking for to settle down and have a family with. But this one would soon be heading back to America. Ellen snuggled under the covers, still enjoying the evening with Tomas. Not exactly an evening with him. They were just colleagues who had a couple of chance meetings. That’s all.